The year 2017 was a time of unexpected successes for North Korea although it is not ruled out that some of them will bring quite a few problems for that country and its leadership. The main tasks that the Supreme Leader, Marshal Kim Jong-un, is trying to resolve are fairly obvious and do not differ much from the goals that the leaders of some of the most diverse countries faced in the most diverse historical periods. He together with his entourage must preserve power and take the country out of the deadlock where it has been stuck already for more than a decade now. The young North Korean leader is resolving both tasks very successfully. Kim Jong-un is facing three main threats in his attempts to preserve stability. First of all, the elite, primarily the military may stage a conspiracy. Secondly, there is the threat that disturbances might take place and that there may even be a revolution, and thirdly, there is the threat coming from outside, first and foremost but not exclusively from the Unites States. The policy of the Democratic People's Republic of Korea (DPRK) in 2017 focused on countering these potential threats plus improving the economic situation. In February 2017 the North Korean intelligence service carried out a stunning operation to eliminate Kim Jong-nam, Kim Jong-un’s paternal half-brother. He lived abroad for over twenty years and sometimes displayed signs of highly independent, even challenging political conduct. His elimination means that there is not a single member in the Kim clan that would be perceived as an independent player capable of even theoretically challenging Kim Jong-un (the other excessively independent member of this clan, Jang Song-thaek, was arrested and then executed in 2013). At the same time Kim Jong-un continued to regularly reshuffle people who occupied top positions in the military hierarchy. Thus, the Head of the Main Political Department Hwang Pyong-so, who was considered one of the most influential figures among the top military leaders, suddenly disappeared at the close of 2017. This reflects another feature of Kim Jong-un. He is prone to frequently changing members of the law-enforcement agencies. Incidentally, the disappearance of generals and marshals does not necessarily mean that they are executed. Some of them later reappear in public. But this does not change the main principle which is that they are not allowed to occupy their positions for a long period of time so preventing them from establishing any ties. As distinct from law-enforcement agencies, the government’s financial and economic sector is distinguished by stability. This is not surprising. The Finance Ministry or the State Committee on Statistics cannot stage a coup de etat but manage to cope with their duties rather well. Since 2012 Kim Jong-un’s government has conducted radical market economic reforms, trying not to attract too much attention to this line and even rejecting the fact that the ongoing changes should be described as reforms. He hushed up this to preserve political stability in the country and not to tempt the common people. 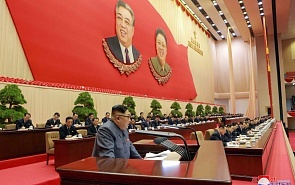 Kim Jong-un’s reforms were very similar to the changes conducted by Deng Xiaoping in China since the late 1970s. Starting in 2012 he began to transfer agriculture to family contracts, which substantially improved the food situation. In 2015 he launched an industrial reform, giving unprecedented independence to the directors of state-owned enterprises. In addition to all this, the North Korean leaders completely stopped all campaigns against private businesses that, contrary to widespread opinion not only exist in North Korea but are playing a tangible role in its economy. In 2017 North Korea completed the transfer of its agriculture to family contracts. Peasant farms were given plots of land on a long-term basis. They were supposed to till the ground and give the state a share of their harvest, that is, to pay in kind. The transfer to the new system sharply increased harvests and North Korea became almost self-sufficient in food. Although malnutrition still exists in depressed areas, there is no hunger in North Korea and the food situation is quickly improving. The general economic situation is becoming better as well. It is difficult to determine North Korea’s economic growth because all statistics are classified, but judging by everything it was between 4-5 percent in 2017. The economic upsurge considerably improves living standards and for this reason Kim Jong-un together with his government are truly popular in the country (another reason why the majority of the population are proud of the successes of the nuclear program). Obviously due to these conditions, any disturbances are unlikely. However, it is the nuclear problems rather than daring murders or sound reforms that are attracting the world’s attention to North Korea. Its leaders began to think about nuclear arms as early as back in the 1960s. North Korea conducted its first nuclear tests in 2006. However, its nuclear and missile experts unprecedentedly intensified their efforts with Kim Jong-un’s advent to power because he faced them with new strategic tasks. His father was content to have a small deterrence potential whereas Kim Jong-un tried to sharply increase the nuclear arsenal as well as to develop carrier vehicles capable of striking the US mainland. It is in this area that North Korea made impressive achievements in 2017. Its experts tested a fully-fledged thermonuclear explosive for the first time and successfully launched its new Hwasong-14 and Hwasong-15 missiles. These are intercontinental long-range ballistic missiles that can reach the greater part of the US mainland. Some experts doubt that they may carry a nuclear warhead to its target but even if their doubts are justified this year North Korea reached its main goal which was to develop intercontinental missiles that can deal a nuclear strike on any American city. To sum up, North Korea has already turned or is about to turn into the world’s third country that can strike US territory. The American leaders together with the public consider this situation unacceptable, partly because North Korea has a reputation of an unpredictable and irrational country the leaders of which are capable of any insane actions. Thus, the successes of the North Korean missile specialists have led to the emergence of a dangerous situation in Northeast Asia. For the first time in several decades now we are facing not a diplomatic imitation of a crisis but a real albeit small threat of war that may be started by the United States. Throughout 2017 the United States regularly hinted at the possibility of using armed force to resolve the North Korean nuclear problem. In addition to this it started bringing pressure to bear on its allies as well as on third countries, compelling them to occupy the toughest possible stand on Pyongyang. Judging by everything, China has also decided to toughen its position on North Korea. Most probably, this is linked with China’s obviously serious concern over the risk of war on the Korean Peninsula. China is ready to impose tough economic sanctions on North Korea, obviously realizing that they may undermine the launched rebirth of the North Korean economy and even provoke a revolutionary situation. Interested in the preservation of the status quo, China has always been determined to keep North Korea afloat, in particular, with financial injections. However, now Beijing is likely to perceive a potential crisis in North Korea as a lesser evil compared with the risk of a full-blown armed conflict. As a result of all this, acting in unison with the United States, at the close of 2017, China introduced unprecedentedly tough sanctions against Pyongyang. For the time being it is unclear how they will influence the situation in North Korea but there is no doubt that no sanctions, even the toughest ones will compel the North Korean leaders to give up any of their nuclear weapons. They remember well what happened with Muammar Gaddafi who once agreed to curtail his nuclear program in exchange for a promise of economic aid and the cancellation of sanctions. Nor have they forgotten about the sad destiny of Saddam Hussein. The North Korean leaders have grounds to believe that nuclear weapons guarantee the preservation of both the current regime as well as the North Korean statehood. Even if the new sanctions provoke a deep economic crisis and North Korea is again threatened with hunger as in the 1990s, it will still remain a nuclear power. To sum up, 2017 was a successful year for intelligence officers, economists and missile specialists. It was another year of economic growth for the majority of the population. However, in the first months of 2018 North Korea will have to face serious economic and political problem, including the threat of an armed conflict. The situation concerning North Korea remains unstable even by the yardstick of the current unstable world. ﻿The year 2017 was a time of unexpected successes for North Korea although it is not ruled out that some of them will bring quite a few problems for that country and its leadership.